Bezabih Petros scored the historic, first confirmed MiG-21-kill of the Ogaden war and thus the first ever in air combat between U.S.-made F-5E Tiger IIs – Satenaw Ethioopian News & Breaking News: Your right to know! Which is better? The Northrop F-5E Tiger II or the Mikoyan i Gurevich MiG-21? There have been countless discussions of this question and, probably, at least as many answers. Over 15,000 of these two cheap, lightweight, simple-to-maintain and -operate fighters were produced and, over the time, they’ve served in more than 60 different air forces — some of which operated both of them. The usual story is that they never met in combat and thus the ultimate question about their mutual superiority remains unanswered. But actually, they did clash — and not only once. Indeed, their first battles proved decisive in the outcome of a long-forgotten conflict over the Horn of Africa. The mid-1970s saw Ethiopia descend into political chaos. A military coup removed Emperor Heile Selassie, a close ally of the United States, in 1974. A bloody power struggle then raged between different cliques through Addis Ababa for the next three years. Massive discontent and low-scale insurgencies in the Ethiopian federal states of Eritrea, Ogaden and Tigray erupted into all-out wars, and insurgents advanced rapidly. Ethiopia appeared to be in a state of dissolution, its military and security apparatus in disorder and unable to maintain the country’s sovereignty. This was the moment the government of Somalia — run by Maj. Gen. Siad Barre — saw an opportunity to realize its own long-standing political aim — the liberation of all “illegally-occupied Somali territories.” Predominantly populated by ethnic Somalis, Ogaden became a primary target. U.S.-trained pilots of the 5th Squadron, Ethiopian air force, in front of one of their mounts. Standing, left to right — Fikur Maru, Ashenafi Gebre Tsadik, Belay Teklehaimnot, Techane Mesfin, Berhanu Wubneh and Techale Zewdie. Kneeling, left to right — Girma Workagexehu, Estifanos Mekonnen, Addis Tedla and Ambachew Wube. Nearly all flew combat sorties during the Ogaden war, and several scored MiG-kills. Photo via S.N. The Somali war plan was relatively simple and based on the assessment — shared by Soviet advisors based in Somalia — that the Ethiopian military would quickly collapse under pressure. Following extensive preparations and the mobilization of the entire military, Somalia invaded on July 13, 1977, its ground forces supported by a total of around 25 MiG-17s and 29 MiG-21s, all of whose pilots were trained in the former Soviet Union. Initial successes confirmed pre-war assessments. Within two weeks, mechanized units of the Somali army overran the Ethiopian garrison at Gode, shot down one Ethiopian F-5E with an SA-7 Grail shoulder-fired missile and bombed Harar airfield and destroyed a Douglas DC-3 belonging to Ethiopian Airlines. A pair of MiG-17s shot down a Douglas C-47 transport of the Ethiopian air force. Amid the chaos — and because Ethiopia and Somalia severed their diplomatic relations in early 1977 — the government in Addis Ababa was slow to understand what was going on in Ogaden. The military announced general mobilization but this took weeks to complete. The few army units deployed in Ogaden found themselves isolated and deep behind enemy lines. This was the reason the lonesome C-47 was caught by Somali MiGs. However, the Ethiopian air force was anything but neutralized. Created with British and Swedish aid in the 1940s and ’50s, this force received plentiful U.S. support starting in the 1960s. It was a small but elite military force, staffed by hand-picked personnel and carefully and intensively trained — at home and abroad. Bezabih Petros scored the historic, first confirmed MiG-21-kill of the Ogaden war — and thus the first ever in air combat between U.S.-made F-5E Tiger IIs and Soviet-made MiG-21s. Photo via S.N. It didn’t bristle with dozens of shiny aircraft. Its centerpiece was around a dozen each North American F-86 Sabres and Northrop F-5A Freedom Fighters. By 1974, Ethiopian-U.S. relations were good enough for Addis Ababa to request delivery of McDonnell Douglas F-4 Phantom fighters, but Washington offered 16 Northrop F-5E Tiger IIs, instead, armed with AIM-9 Sidewinder air-to-air missiles and supported by two Westinghouse AN/TPS-43D radars. Due to unrest and human rights violations in the country, only eight Tigers were delivered in 1976. However, contrary to Somali and Soviet expectations, their pilots didn’t sit idle during the months prior to Somali invasion. Following intelligence reports about the Somali build-up along the border, the air force ran a series of intensive air-combat exercises. One of the TPS-43s was positioned high on the Karamara Pass and F-5Es began flying combat air patrols. Air combat between Ethiopian-flown F-5Es and Somali-flown MiG-21s was thus unavoidable. The first clash took place during the afternoon of July 24, 1977, when two Tigers intercepted a pair of MiG-21s about to catch another lumbering Ethiopian transport. Expertly guided by the ground control, the number two of the Ethiopian formation, Bezabih Petros, scored a truly historic victory — the first confirmed kill ever for the Ethiopian air force, and the first ever for the F-5E in air combat against a MiG-21. 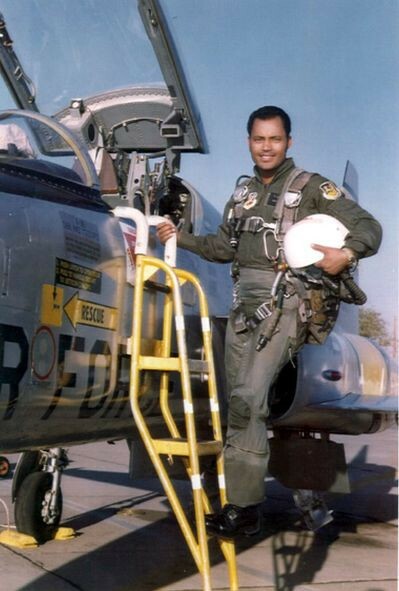 Lagesse Tefera — top-scoring Ethiopian F-5E-pilot of the war with a total of four confirmed kills to his credit — seen during training in the United States. 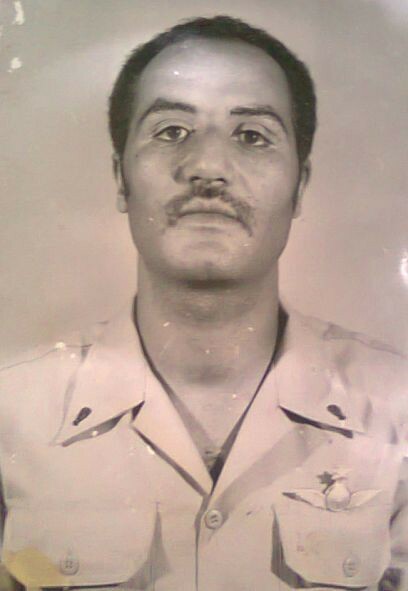 Tragically, he was shot down by Somali air defenses on Sept. 1 1978 and spent 10 years in a Somali jail. Photo via S.N. Only a day later, Lagesse Teferra managed a special feat in the course of what eventually proved the biggest air battle of the Ogaden war. While leading a trio of F-5Es, he intercepted a formation of four MiG-21s that was providing top cover for four MiG-17s. The appearance of the Ethiopian Tigers caused two Somali MiG-21s — including one flown by the commander of Hargheisa air base, Col. Mussa — to collide. Lagesse then shot down the third with cannon fire. His wingmen Bacha Hunde and Afework Kidanu then finished off the fourth Somali plane. Finally, Lagesse attacked the MiG-17s and shot down two with AIM-9 missiles. On July 26, Lagesse Tefera and Bezabih Petros intercepted a pair of MiG-21s that was approaching the forward Ethiopian air base at Dire Dawa. This time, Bezabih damaged a MiG with a Sidewinder and Lagesse finished it off with fire from his 20-millimeter cannons. Three days later, Bacha Hunde scored his first — and only — confirmed victory of the war. This success enabled Ethiopian airmen to smash numerous enemy supply columns and thus significantly contribute to a victory during the battle for Dire Dawa, which ended the Somali advance into Ogaden in mid-August 1977. In the course of this clash, Afework Kidanu shot down one MiG-21 on Aug. 19. Ashenafi Gebre Tsadik felled another two days later. Ashenafi and Lagesse scored the last two kills during the final dogfight of the Ogaden war on Sept. 1 1977, destroying another pair of MiG-21s. With this, the Somali air force was all but finished. Although it continued operating over Ogaden, it never recovered from its heavy losses. In turn, having secured aerial superiority, the Ethiopians unleashed their air force to conduct a systematic campaign of attacks on the Somali supply system. Within less than a month, the Somali army inside Ethiopia was short on nearly everything — ammunition, food, fuel and even tanks and transport vehicles — and unable to advance. Ethiopian F-5Es thus won the decisive victory of the Ogaden war — and bought plenty of time for politicians in Addis Ababa to secure Cuban and then Soviet support, which enabled the Ethiopian military to launch a counteroffensive and drive the Somalis out of Ogaden in early April 1978. Post-war analysis by all involved parties was clear. Not only that the F-5E proved superior to the MiG-21 — not in speed, but certainly in maneuverability at low and medium altitudes, and in terms of endurance and weaponry. Also, the training provided to the Ethiopians by their U.S. advisors was of much superior quality and far more realistic than that provided to the Somalis by their Soviet instructors. Bezabih Petros the devil reincarnated EPLF had him and enlightened him on Eritrean politics but because he is a devil he came to attack us again but EDF had the best of him, hope no more of his likes who will eat and drink with you and they have the devil in their head they bomb you, when you catch a person like him, you skin him ALIVE,that’s it, Peteros Bezabeh has been evaporated and he deserves it million times!!! !